Main - Sound Choice Disc Jockeys, Inc.
Sound Choice Disc Jockeys, Inc. The original “Non-Tacky” DJs. No props. No gimmicks. No inflatable toys. 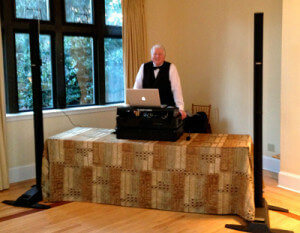 Mature, professional DJs provide musical entertainment with style and class, customized for your event. State-of-the-art technology makes the music sound great indoor and outdoor – never annoyingly loud – and wireless speakers enhance the experience for venues with multiple rooms. Sound Choice Disc Jockeys, Inc. is not affiliated with, approved or sponsored by Sound Choice Accompaniment Tracks of Charlotte, North Carolina. Sound Choice Disc Jockeys, Inc. does not sell karaoke products or offer karaoke services. © 2019 Sound Choice Disc Jockeys, Inc.. All Rights Reserved.